Rare Broadsheet or Letter Sheet View of San Francisco, California. 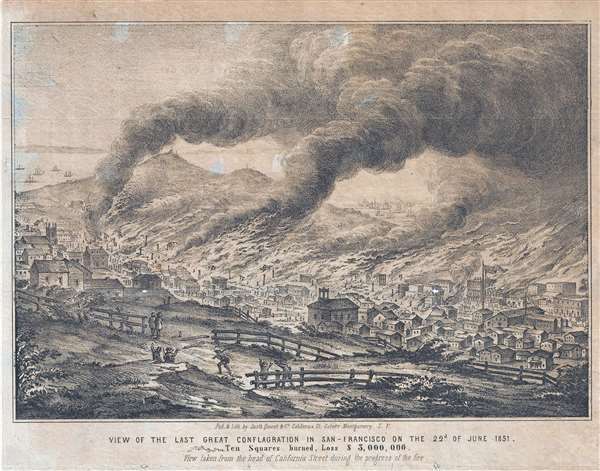 View of the last great Conflagration in San Francisco on the 22nd of June 1851. Ten Squares burned, Loss $3,000,000. View from the head of California Street during the progress of the fire. An extremely rare Justh, Quirot and Co. 1851 letter sheet or broadsheet view of San Francisco during the San Francisco Fire of June, 1851. It looks down on the burning city from a pastoral hill at the head of California Street. This letter sheet was issued in San Francisco just days after the June 22nd conflagration. The small size of this letter-sheet is reflective of the small and press that the firm, one of San Francisco's first printers, was able to salvage from the earlier May 3-4th conflagration. It would not be until 1852 that they finally acquired a larger format press. Although only 2 years after the 1849 discovery of placer gold in the nearby Sacramento Valley, and the subsequent boom in building, by 1851 San Francisco was already a bustling city. The San Francisco Fire, doubtless the work of an incendiary, began around 11 AM in house on Pacific Street near Powell. Given the high winds, the predominantly wooden city, including wood plank sidewalks, was quickie engulfed in the conflagration. Ten blocks, City Hall, and portions of six others blocks were destroyed. The city had suffered 5 earlier major fires, including a city-wide conflagration just one month earlier in May. San Franciscans quickly rebuilt using less flammable materials and added water takes to the roofs of most new buildings. This proved an effective counter-incendiary and the city did not suffer another major fire until the Great San Francisco Earthquake of 1909. This view is quite rare due it the ephemeral nature of the medium – letter sheets – and the great loss of surviving sheets that occurred during the 1909 San Francisco Earthquake. The OCLC identifies only 2 examples. An additional example is held at the Bancroft Library. We are aware of one other in private hands. Market presence is negligible, making this a once in a lifetime collecting opportunity. Justh, Quirot and Company (fl. 1851 – 1853) was a San Francisco based lithographic company founded by C. Quirot and Emil (Emmanueal) Justh. They are one of the earliest and most important printing houses in San Francisco. Most of their early work appeared as quarto sized letter sheets, possibly reflecting the size of their press (or perhaps the press they were able to save from the 1851 fire). Later they issued larger format city views, probably after acquiring a larger press. Justh and Quirot maintained offices at 253 Montgomery Street (1851, post fire), 136 1/2 Clay Street (1852), and 136 California Street (1851 – 1853). Little of their early work survives due to a combination of numerous conflagrations that tore through the city and the 1906 San Francisco earthquake. The firm closed in 1853 and many of their plates were sold to competitors, Britton and Rey. Of the partners, Emil Justh was a Hungarian lithographer who immigrated to San Francisco in 1851. After leaving Justh, Quirot he worked as an assayer for the U.S. Mint in San Francisco, between 1854 and 1855. He later went on to found and run an assaying business with Solomon Hunter from 1855-1858. Of Quirot little is known. Very good. Even overall toning. Some loss at old fold intersections. Edge reinforcement on verso. OCLC 41411049. University of California, Berkeley, Bancroft Library, BANC PIC 1963.002:168—A.